This multi-area massager comes with three sets of removable heads that provide a wide variety of massaging options. The product is great for tension relief and sore muscles and can be used on all areas of your body, including your back, neck, feet or legs. So what better way to end a stressful day at work if not by taking a hot bath and indulging yourself in a relaxing massage session in the comfort of your own home? Unlike other massage devices that are specifically designed to be used at home, this one from Viktor Jurgen is highly portable and lightweight. Therefore, it can be used anywhere you are and can even make for a great travel companion. 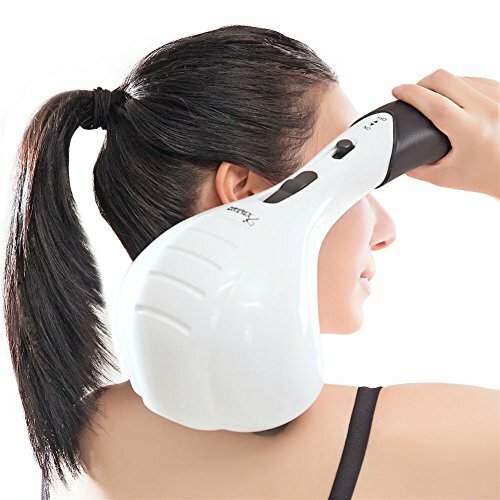 There are no bulky pieces and the shape of the massager is similar to the one of a shower head, so it will easily fit in your purse, bag or luggage. Instead of emitting just one set of pulsations, this massage device is equipped with a 100% copper motor and three different massage heads to deliver the right pressure and release stress according to your needs. The intensive massage node is perfect to be used around your back area and will release tension from bad posture or from staying at your desk the entire day. In time, it will promote a healthier back posture and will help you relax your muscles. The deep tissue massage node can be used to revive sore muscles after harsh training sessions or stressful days at work. It is perfect to be used on your neck, thighs or calves, and, alongside a salt bath, it will do miracles for your tired feet. If you’re looking for a product to get you rid of stress after a long day at work or running your household, this item is perfect. It can be used alone or with your favorite massaging creams to get a full spa experience. You can adjust the intensity of your massage routine according to your preferences, from slow to fast, so you’ll always get the required areas of your body massaged perfectly. If workout routines often get you tired at the end of the day, this massage device will work on your muscles, releasing tension and helping you tone your legs faster. Another therapeutic benefit of this product is that it helps improve blood circulation when used on your entire body or especially on your legs. As a result, your feet will feel rejuvenated and, when used with the correct creams or scrubs, you can also reduce the aspect of cellulite. Most of the customers who ordered the Jurgen Electric rated it a full five stars, claiming it is not only easy to use, but also extremely convenient. Using it is like enjoying a relaxing spa experience in the comfort of your own home while watching your favorite TV show.